A high degree of standardization makes it possible to mount electrodes with DIN dimensions directly into a fitting. For most other types a mounting kit (accessory)is available. A wide choice of construction materials gives the user the optimal solution for any process considering chemical resistance, pressure and temperature specifications. Wide choice of construction materials. High degree of standardization reduces spare holding requirements. Direct mounting of sensors with DIN dimensions. Liquid earth pin for stable measurements. High pressure and temperature specifications. Chemical cleaning systems as an option. 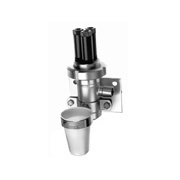 Electrolytically polished stainless steel fittings for optimal corrosion resistance.